Red twig dogwood will brighten your winter landscaping with its bright red branches; the shrubs actually can provide year-round interest. Despite bearing spring blossoms, variegated leaves during summer, and berries from summer to fall, clearly, this plant's common name explains the main reason that people grow it: namely, the bush's red twigs, which are brightest from late winter to early spring. Red twig dogwood shrubs should be planted somewhere in your yard where they can be easily viewed from a window, to take advantage of their status as top-notch specimen plants for winter landscapes. For optimal display, it is advisable to grow them against a wall that receives ample sunlight from the south or west in winter. 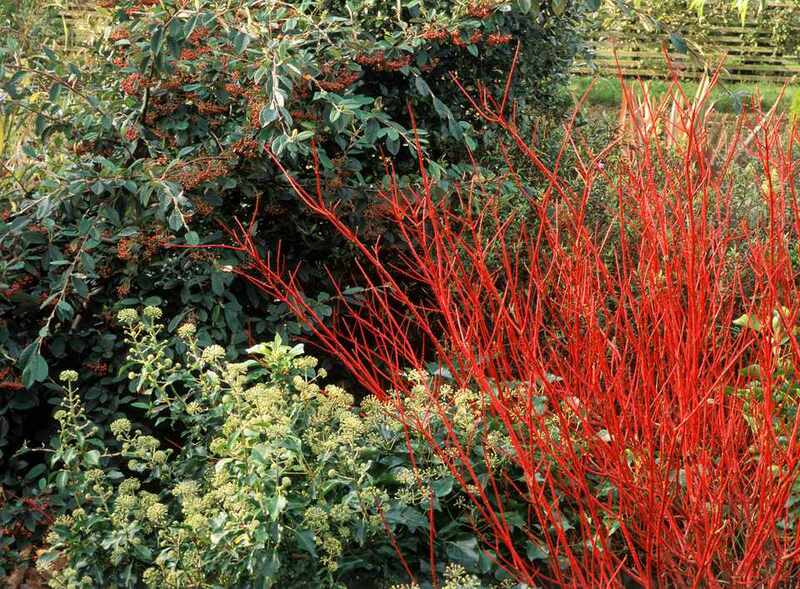 Use them in combination with yellow twig dogwoods for an even more stunning winter display. With or without their yellow cousins, red twig dogwoods look best massed together. On a more practical level, their widely-spreading root systems make them effective plants for erosion control (for example, on steep bankings). These shrubs bear variegated leaves (greenish-gray with a white edge) and small white flowers that form in flat clusters. The flowers are succeeded by berries that are a white color ( alba, the species name, means "white" in Latin) with hints of blue and green. The fall foliage can pick up hints of rose or gold, but most gardeners find the foliage less attractive, overall, in autumn, as leaves pick up brown spots with age. You will be glad that the foliage is deciduous, as you will have a clear view of the red color of the bark in winter. Red twig dogwoods will tolerate partial shade, but their signature red bark will be brightest if they are planted in full sun. Red twig dogwood bushes are considered good plants for wet areas (for example, wet spots where homeowners may wish to establish woodland gardens), although some report that they perform better in well-drained soils. Work humus into the soil for nutrients. Somewhat acidic soil is preferred. These plants prefer moist areas. They thrive in low spots or along streams or ponds. If there is not a lot of rain, water new plants weekly for the first few months. Mature plants only need watering during dry spells with no rain for more than a week. This shrub has adapted to a wide range of temperatures. It does not do well in extremely hot and humid climates where it can be vulnerable to disease like canker. Fertilize red twig dogwood in the early spring, side-dressing it with compost. When it has started to leaf out, you can feed it with fish emulsion, although it will do fine without. If you want to propagate red twig dogwoods, take hardwood cuttings in late fall. Look for a stem that is as wide as a pencil. You should cut it into 6-inch to 9-inch sections with a bud near either end of each cutting. Take off side branches and dip it in rooting hormone. Plant the cutting in the ground or in pots. You can keep the planted cuttings in a cold frame that is closed over the winter. In spring, you can open the cold frame or move the pots. It can take up to a full year for the cutting to root. Once they are rooted, you can use them in your landscape or nurture them further in a nursery bed. The similarities between these species, and the similarity in their common names, all of which include or signify "red," has led to much confusion as to which is which, even in the nursery trade. If you have your heart set on a particular cultivar, be sure to make your purchase from an establishment that you trust. If erosion control is a significant reason for your purchase of a red twig dogwood, be sure to seek out the red osier type, specifically. Red osier spreads by suckering to form a colony over time. The root system of such a colony can be very effective at holding back the soil on a hillside. Cardinal is an example of a cultivar to look for. The brightness of this bush's red twigs has a tendency to fade over time from early spring to summer, and there is not much that you can do about that. But through proper care, you can do something about the fact that the older branches tend to be less colorful than the younger ones. Care for this plant amounts mainly to pruning. Prune in late winter or after it has bloomed. For maximal color, prune out 1/3 of the older branches every three years or so (or even annually, as long as you do not mind having a plant of a smaller size). Such care will promote new growth. And since the younger branches bear the brightest color, that is precisely the growth that you want to encourage. If the bush is overgrown, you can cut it back to the ground. It will return within a year with young red stems.